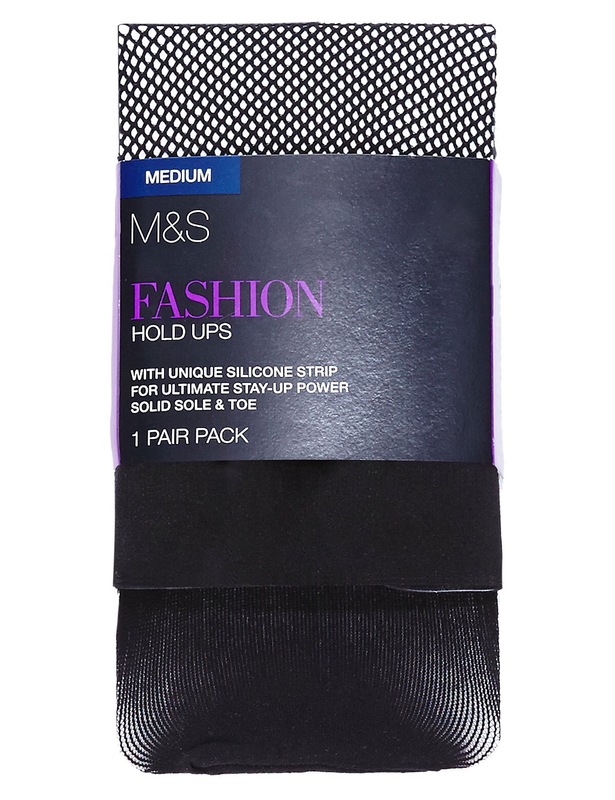 Marks and Spencer’s might seem like an unlikely venue for fishnet stockings but believe me – these are the holy grail of fishnet hold ups. Over the years I have tried brand after brand in search of a pair which not only look good but which actually fit my chunky thighs and are comfortable to wear all day. Since trying these in desperation I have never looked back. I’ve even been known to sleep in them they are so comfy. So to put things in context I am currently a UK size 18 but I have worn these up to a size 22. I am just under 6 foot and my thighs are really bigger than usual for my dress size so I really struggle with hosiery. Being tall, a lot of the stretch goes into the length which causes the fabric to be too thin round my thighs which can cause painful chaffing. That is assuming I can get the legs all the way up at all, but I digress. These hold ups have a really wide silicon band at the top which has fantastic staying power – I can wear these all day without worrying about them rolling down and they have a reinforced toe so they don’t dig into your feet. The band also prevents chaffing and looks really good! Basically these are the perfect fishnets for me and I buy a pack every time I see them. They can be difficult to find in extra large in the shops though so I’m still keeping my eyes peeled for other options. If you have a favourite brand please do share in the comments!